Only a few miles from the U.S. border, Osoyoos is a perfect vacation spot if you like warm water, wine, and sunshine. It’s a small town — only 5,000 year-round residents — which makes the pace perfect for vacations. 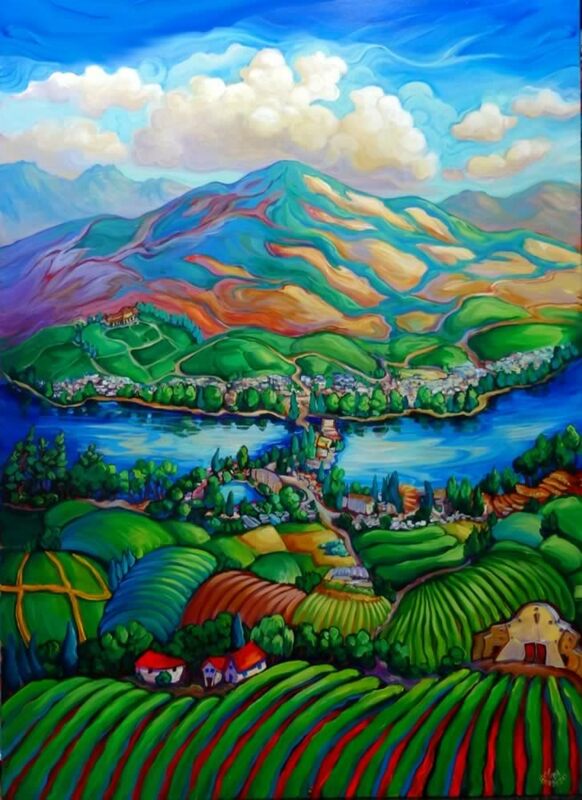 This large piece highlights some favorite locations — the Nk’Mip winery, the Falcon Motel, and the Osoyoos Golf Club. The climate is unusually hot and dry for Canada–in fact, Osoyoos has its own climate zone called the Osoyoos Arid Biotic Zone. This dry climate, along with the Cascade mountains and Osoyoos Lake, make for spectacular skies and big if-only-you-could-float-on-them clouds.